Union Colonel Blanker attempts to force a crossing of Young’s Branch at a ford near Stone House. 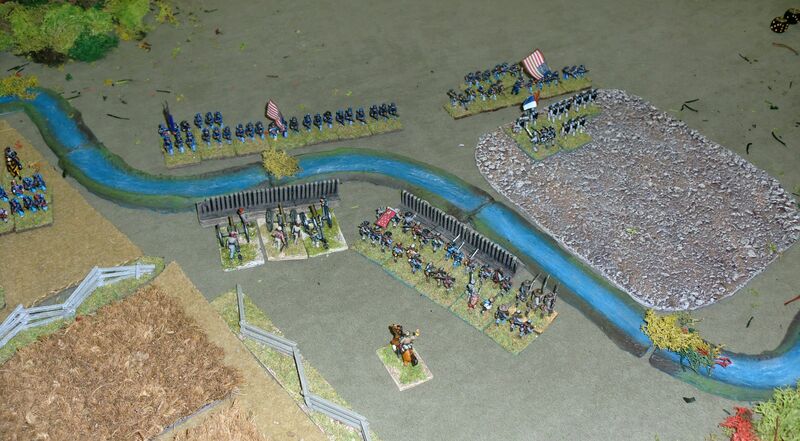 The Confederates, waiting in partially entrenched positions, line the bank behind the river flanking the fords. The Federals attempt an attack on the centre. The Rebels take the bait. The lead regiment forces a crossing. 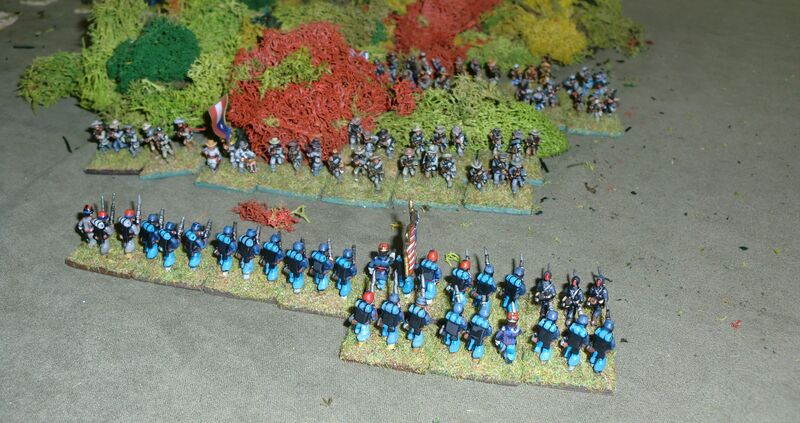 Using the cover of the woods the Federals attack the Confederate centre. 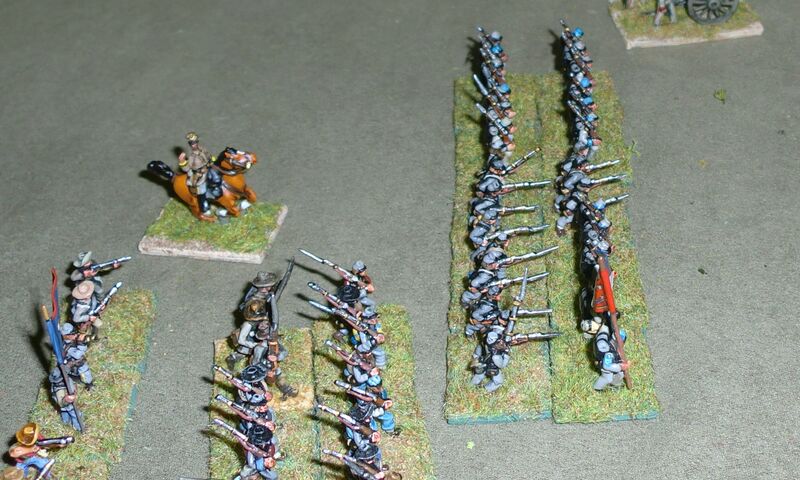 By pinning the Confederate regiments on the flanks they frustrate any attempty to reinforce the centre. 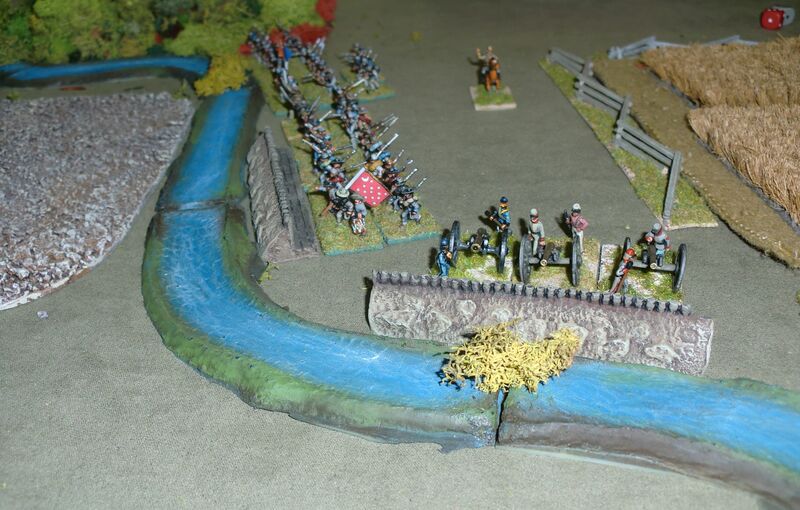 The Union forces push over the ford in force and decimate the defenders, securing the river crossing. 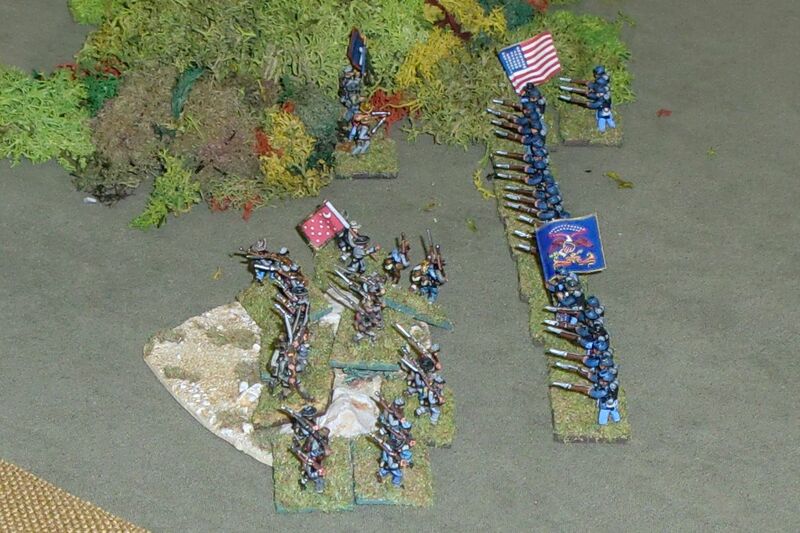 Cocke’s Confederate brigade attacks the far left flank of the Union army. His orders are to carry the Union flank and thus to force the Union Army of Northeastern Virginia to retreat from the battle and fall back on the Union capital of Washington. The Federal brigade moves out. While the Federal brigade moves into a blocking position the Confederate attack is held up by difficult ground. And worse, the brigadiers staff is hit by enemy fire and looses an entire move. The Confederate attack runs afoul. The Confederates loose an entire move. The 19th Virginia attacks the Union centre. While the attack of the Confederate right wing is fought to a stand still the main effort is made trough the woods. Shilded from artillery and volley fire the Confederate left wing makes good progress and repulses the opposing Union regiment. Despite of being held up by bad going and a lucky rifle shot the Confederate brigade break through the Union centre and capture the artillery battery. This pushes the Federals past their breaking point. In the face of stiff Union opposition the Confederates earn a hard fought victory. 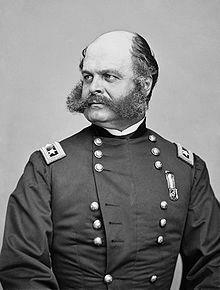 Union Col. Burnside put up a stubborn defence of the army’s left wing. 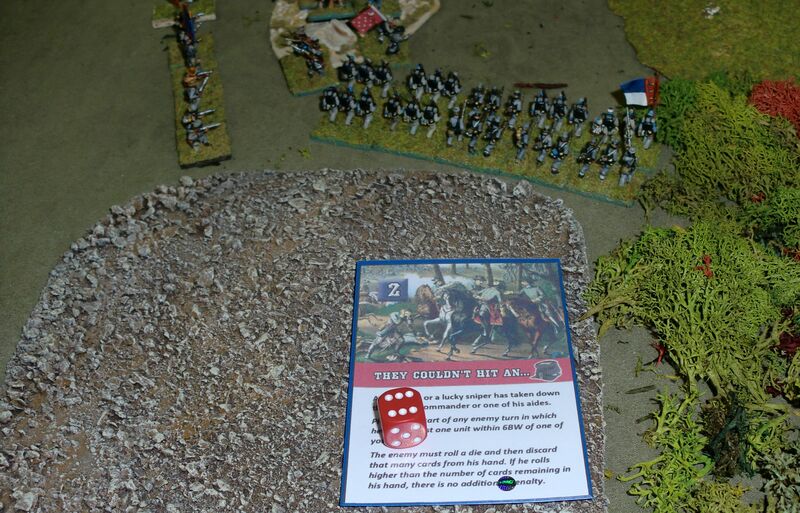 Relying heavily upon his brigade’s artillery and infantry fire he preserved the fighting powerof his command. This is seen as not so much inspiring but rather professional approach to leadership (3 EP). For his competent leadership he is breveted Brigadier General. 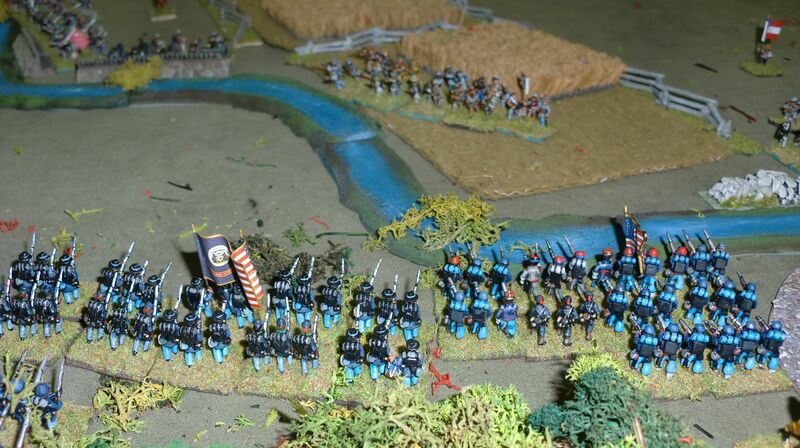 Since long I have fancied to play a American Civil War “Grand Campaign” using the LONGSTREET rules by Sam Mustaffa. 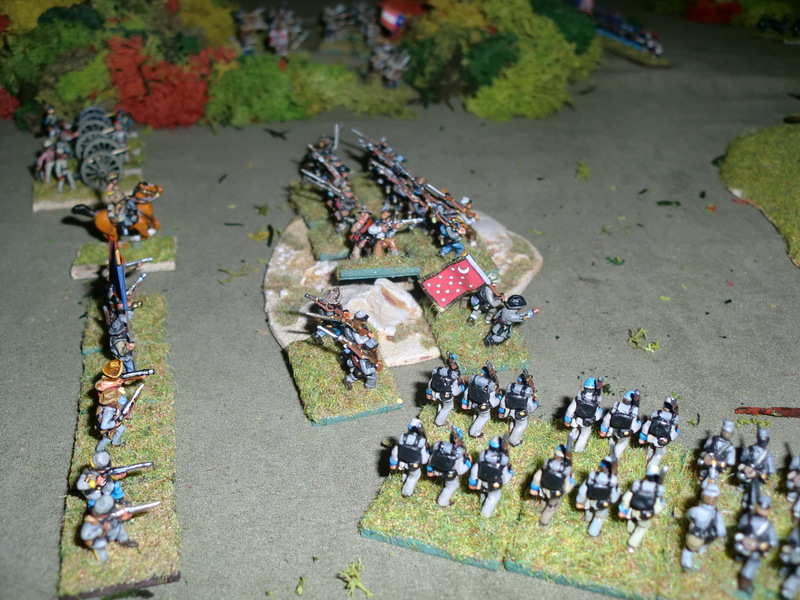 When a small wargaming convention came along last weekend I took the opportunity and incented some of my fellow wargamers to take a side in the occasional face to face battle. 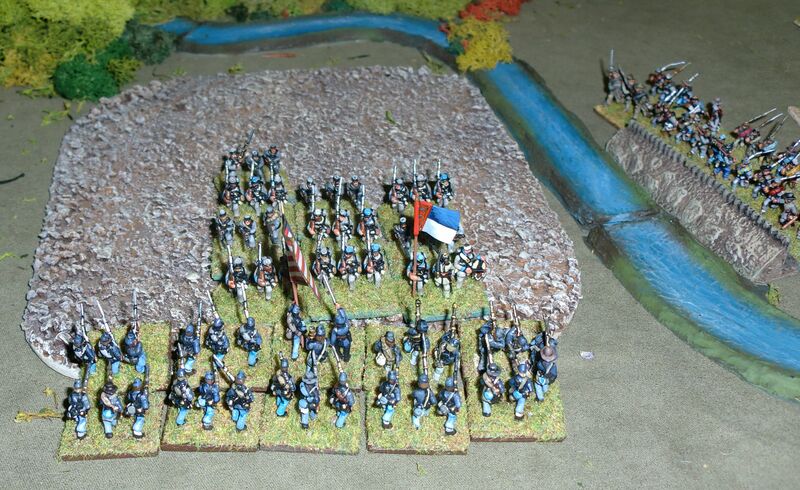 Unawares, they were the protagonists of the first campaign battles of newly created brigades. 4 regiments of infantry, 1 company of cavalry , aa artillery battery. 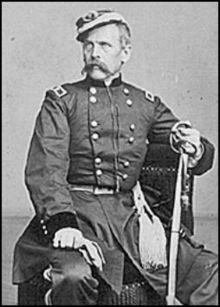 Federal Col. William B. Franklin is to attack CSA Col. Holmes’ Confederates positioned behind the embankment of the Manassas Gap railroad. 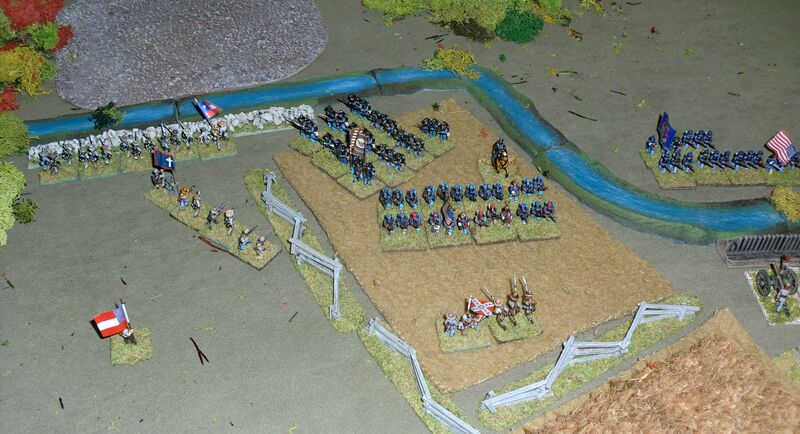 The Federal brigadier intends to pin the defenders frontally and carry the embankment by enveloping the right flank. This should make the position untenable for the Rebell defenders. The Federal left flanking force. The center regiment has strayed into rough going. 11th Mass. attacks the main Confederate position. The main attack by 5th Mass. and 4th Penn. 1st Minnesota defends the Federal left flank. The Federal final attack is repulsed. The Federal attack on the railroad embankment is met with heavy artillery and mini fire followed by a timely counterattack by the Confederate brigade. The Federal brigade suffers heavy casualties, espacially the 11th Massachusetts and the 4th Pennsilvania Infantry Regiments. 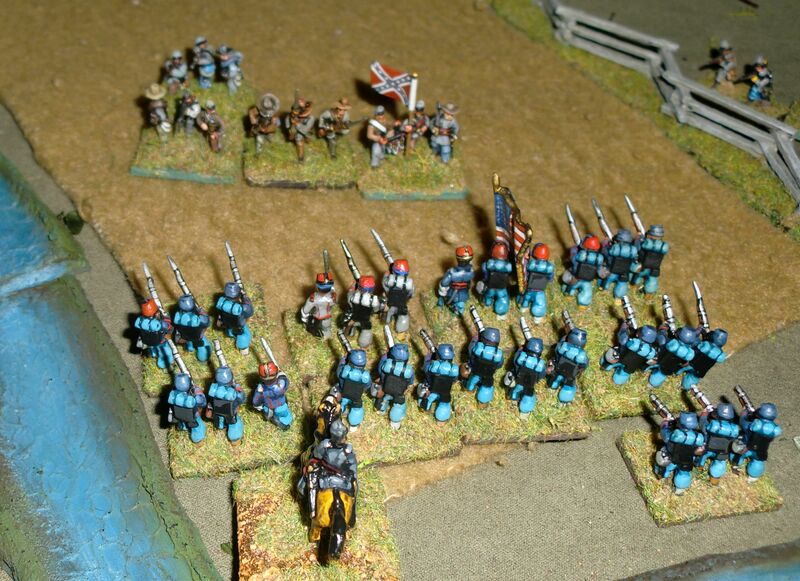 Col. Franklin decides that his heavily struck brigade needs to break off the attack and to reform. The Confederates stay in possession of the railroad embankment and thus win the day. A close Confederate victory. Despite of the failed attack on the Rebell positions Union Col. Franklin receives quite a lot of recognition (4 EP) for his battlefield prowess. 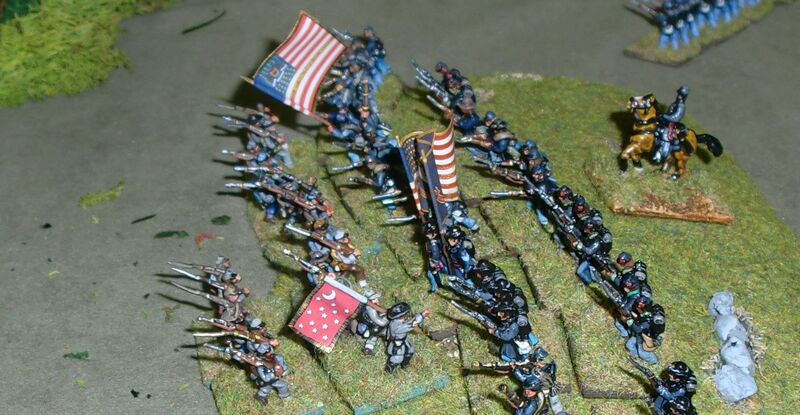 As the Union is wanting for commanding generals who carry the fight to the Rebells, the high casualty rate in his brigade is actually understood as an indication of a good fighting spirit. For this the newspapers give him much credit for his inspiring leadership (+5 EP) making him very popular in the public.